How much do you remember from For Colored Girls...? Find out with this quiz! Sorry! 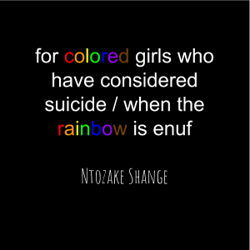 We don't currently have any quizzes for For Colored Girls Who Have Considered Suicide / When the Rainbow is Enuf. However, we have dozens of other quizzes that you can take. Take a look at our library of quizzes.